Exeter based tech company, Custodian Solutions have been honoured at the prestigious Exeter Living awards recently held at the University of Exeter’s, Great Hall on 6 April . The company secured the award for Technology and Innovation, a newly added category in response to a great local strength in the city. Custodian Solutions have developed a cloud based anti -counterfeiting platform. It helps large enterprises to secure, track, trace, authenticate and analyse evidence and data as part of their brand protection and product security strategy. The platform allows enterprises to efficiently identify products at risk and protect consumers. It also allows for thorough enforcement and successful litigation. This award is the latest in a long line of awards that Custodian have received including the SETsquared Entrepreneurship Pitching session, the Judges Award at Pitchfest and Global Anti-Counterfeiting Technology Award nominated by Unilever Plc. 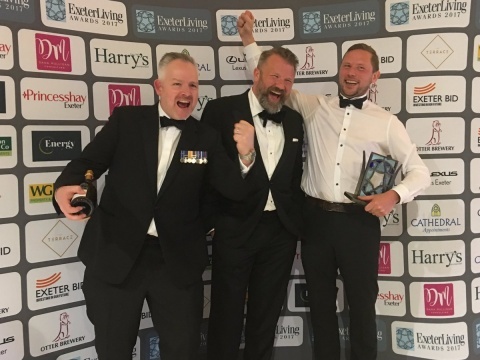 The Exeter Living Awards, now in its second year recognise business successes in the region, featuring a guest list of 400 people invited to a glamourous ceremony at the University of Exeter campus. Other award winners at the evening included the Science Park which took the award for Property and three Science Park Centre companies who were finalists for awards across the categories.